Netflix and chill has a whole new meaning. 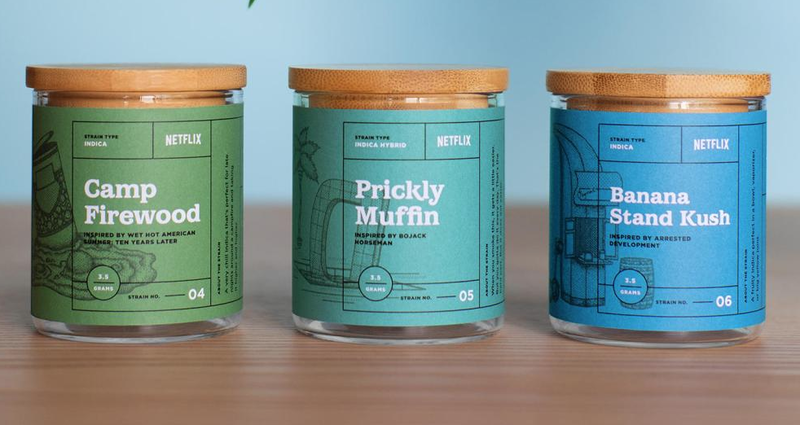 The online streaming network is taking on a new enterprise, selling marijuana strains inspired by Netflix original shows. At first, this may seem like an odd choice. Why would the most popular site for streaming movies and TV shows want to sell weed? It’s as if they think their primary audience might also intersect with the marijuana industry’s primary consumers. Oh wait..it totally makes sense now. This probably is a genius business move for Netflix, but all that money stuff aside, this is great news for happy little stoners everywhere. So what exactly does Netflix weed entail? The Netflix Collection, which is what the TV-themed strains of Kush are called, will be available at a pop-up event at West Hollywood’s Alternative Herbal Health Services from August 25 to 27. Since pot hasn’t been fully legalized in the Golden State yet — that won’t happen until January 1st, 2018 — the Netflix Collection will only be sold to medical marijuana card-holding customers. According to The Guardian, Netflix’s weed strains include Poussey Riot (inspired by Orange Is the New Black), Banana Stand Kush (a nod to Arrested Development), Peyotea 73 (Grace and Frankie), Prickly Muffin, inspired by Netflix’s Bojack Horseman, and more. A press release from Netflix reveals that a lot of thought was put into each show’s respective bud. "Each strain was cultivated with the specific shows in mind, designed to complement each title based on their tone," the release says. "For example, sillier shows may be more indica dominant, while dramedies will be more sativa dominant to help the more powerful scenes resonate." The Guardian reports that Poussey Riot is made for “kicking it with somebody, talking, making mad stupid jokes,” just like Poussey does in OITNB, and the Peyotea 73 is an “uplifting sativa hybrid,” which is so appropriate for Grace and Frankie‘s strain. This is all in promotion for Netflix’s upcoming show, Disjointed, which stars Kathy Bates as a weed dispensary owner. Bates and Chelsea Handler visited Alternative Herbal Health Services to talk pot for Instagram recently, as well. TV and weed fanatics will likely eat this up — well, actually smoke this up, since the collection doesn’t come in edible form — because it’s so fun. Californians, get thee to the dispensary!